Copper bundle intercooler and aftercooler, maintenance-friendly for easy cleaning. Replaceable stage bearings, no need to stock spare stages. DIN and VDE switch cabinet with IP 54 protection, dirt repellent. Three-phase asynchronus motor, ISO class F.
Additional motor reserves for challenging operating conditions. Long service life of the motor due to installation in the cooling air intake section. Nylon laminates fibre mat acoustic lining, noise damping, washable. Connection to a HOC adsorption dryer with no external energy for pressure dewpoints to -40°C (optional for all BOGE SO series compressors). 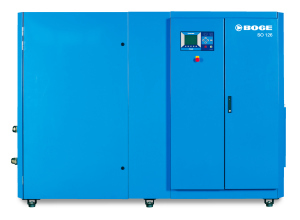 Air and water cooled in BOGE quality for absolutely oil-free compressed air.